Stomach, Forestomach - Parasite, Metazoan in a male F344/N rat from a chronic study. 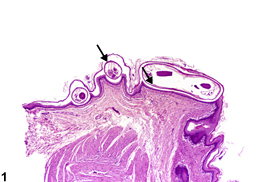 Nematodes (arrows) are present within the mucosa of the forestomach. Stomach, Forestomach - Parasite, Metazoan in a male F344/N rat from a chronic study (higher magnification of Figure 1). 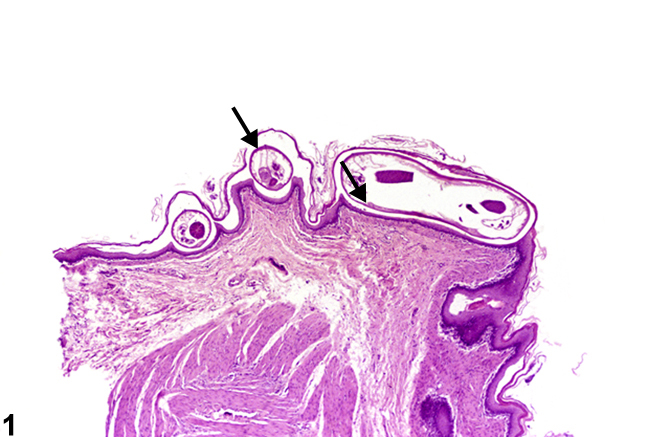 A nematode (cross section, arrow) is present within the mucosa of the forestomach. Because of current husbandry practices, nematode infections are rare. However, Gongylonema spp. have been seen in the forestomach of rats. 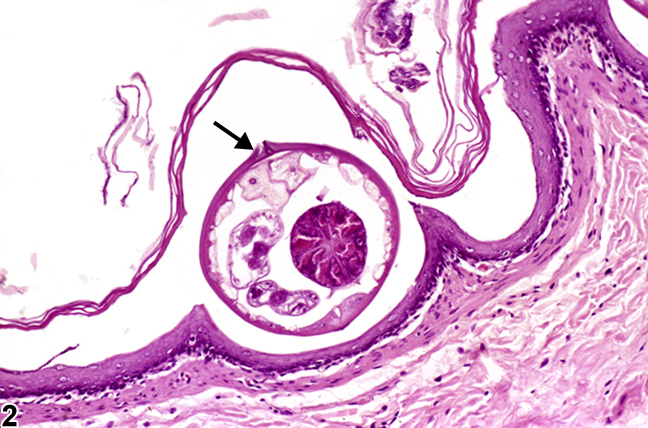 Gongylonema nematodes are metazoan parasites most frequently found in the epithelium of the upper gastrointestinal tract, including the esophagus, tongue, buccal cavity, and forestomach ( Figure 1 and Figure 2 ). They have also been observed in the trachea, bronchi, and lungs of some animals. Other nematode genera have not been seen in the forestomach. Nematodes may elicit little response in the host. Various species occur in primates, rats, mice, and other rodents, plus a wide variety of wild animals. Their life cycle typically requires that an arthropod host, commonly cockroaches and beetles, ingest their ova. The presence of the arthropod vectors in a colony environment may result in transmission of this parasite within the colony. 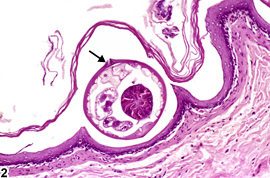 Nematodes are to be diagnosed as "parasite, metazoan" but not graded. If the genus species can be identified it should be noted in the pathology narrative. Accompanying inflammation or other associated lesions should not be diagnosed separately unless the pathologist feels it is due to a different pathologic process or it is severe enough to warrant a separate diagnosis. Stookey JL, Moe JB. 1978. The respiratory system. In: Pathology of Laboratory Animals, vol 1 (Benirschke K, Garner FM, Jones TC, eds). Springer, New York, 71-113.